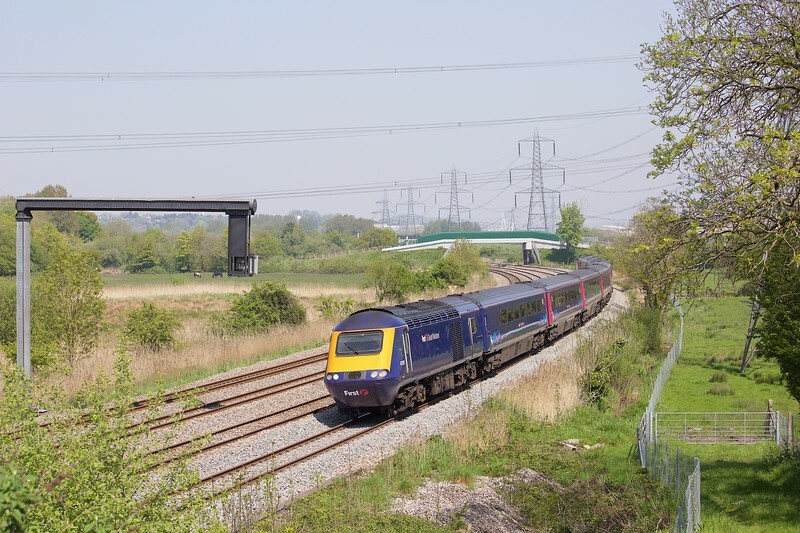 The GWML electrification project has transformed views and traction at Didcot station since the ‘go live’ in January 2018. Representing the old order, however, are 43128 and ‘176 storming towards the capital with the 1L50 1036 departure from Cheltenham Spa. The date is January 16th 2018. 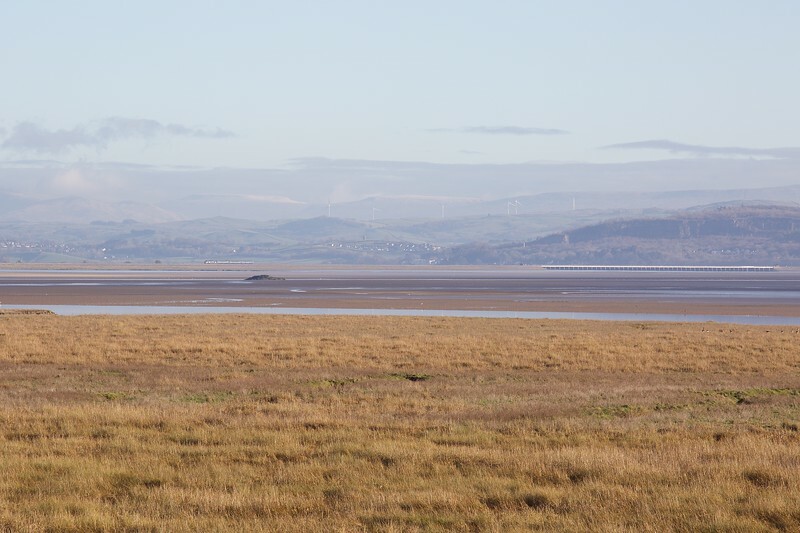 It's just over three miles by rail from Arnside to Grange-over-Sands, considerably shorter than the road distance since trains use Arnside Viaduct. Having crossed the viaduct, seen at the right of this image, 37401 'Mary Queen of Scots' (look carefully!) approaches Grange on January 26th 2018 with the 2C47 1003 from Preston to Barrow-in-Furness. The Tractor 'thrash' was audible from miles away on this still, mild and beautiful winter's day. 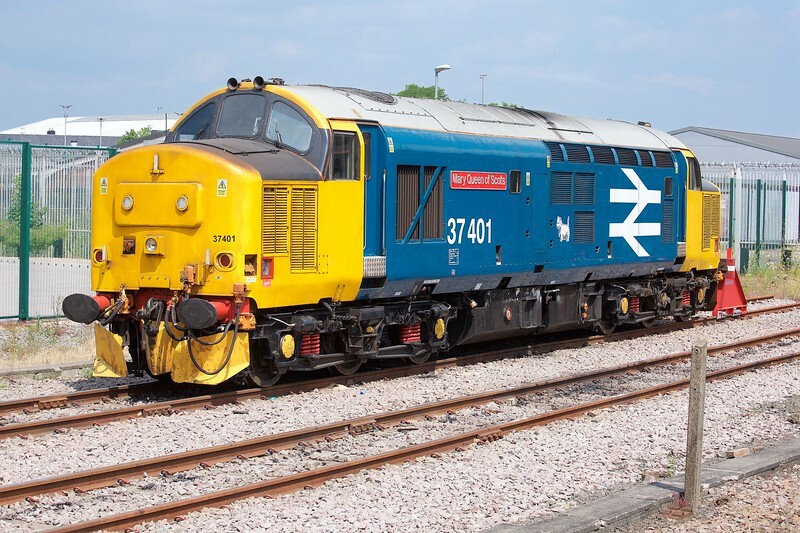 Prior to planned take-over of a 'Northern' working on the Cumbrian Coast from the increasingly unreliable class 37s, DRS ran class 68 training diagrams. At the end of the third week of training, on Friday 26th January 2018, 68003 'Astute' trails 68029 near Grange-over-Sands with a 5Z57 0750 Carlisle Kingmoor - Carnforth D&UGL. In the end, top-and-tail class 68s started on one of the two diagrams from March 13th. The sunny weather further west had vanished at Ais Gill for this shot of 66305 heading a short 6K05 1246 Carlisle New Yard - Crewe Basford Hall engineers' working on 26th January 2018. Wild Boar Fell looms large. Late February and early March 2018 saw significant snow falls across the UK. This is Canonbury on 28th February and, just before 6AM, it is bitterly cold. 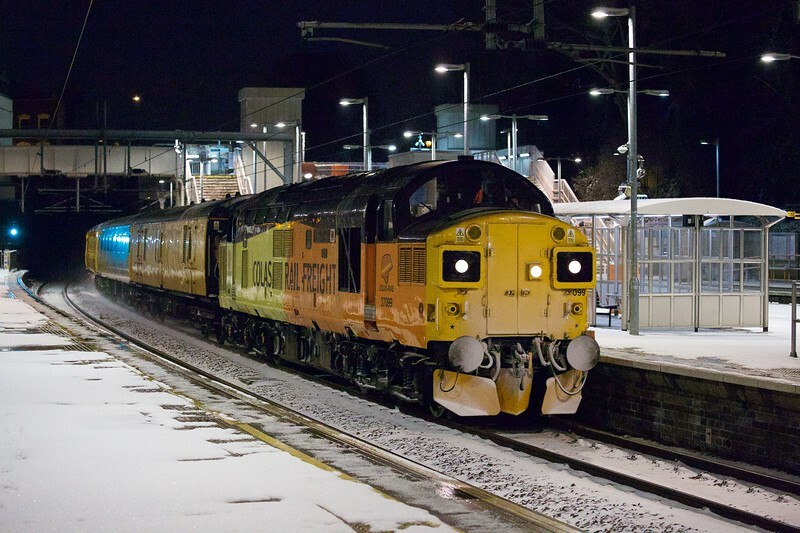 37099 'Merl Evans' has been out all night, with 37421, top-and-tailing this 1Q96 1438 Ferme Park circular Network Rail test-train that has taken in the LTS section, NLL, WLL and GOBLIN. Modern SLRs permit night photography of moving trains; this was taken at ISO 16000! 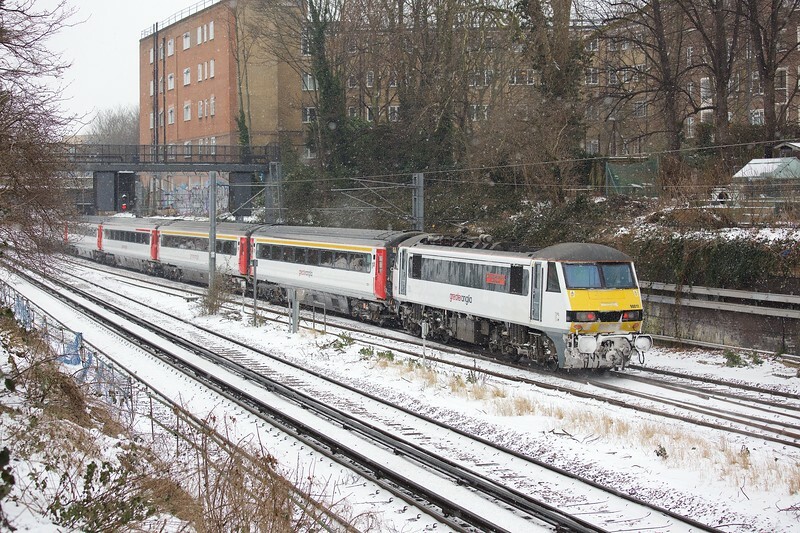 Weekdays from 15th January 2018 saw a Greater Anglia class 90 and mark III push-pull set stable between the peaks at Bounds Green rather than Orient Way, bringing the first regular loco-hauled ECS turn to the NLL for many years. Reports suggest this was to permit maintenance at Bounds Greeen, space at Norwich Crown Point being limited by re-building work in connection with the new GA 'Flirt' fleet. The set that works the 1P07 0624 Norwich - Liverpool Street works to Bounds Green TRSMD as 5E12 at 0838, returning 5L54 at 1659 for the 1P54 1810 Liverpool Street - Norwich. In snowy conditions on 1st March 2018, 90011 pushes 5E12 across Canonbury West Junction. 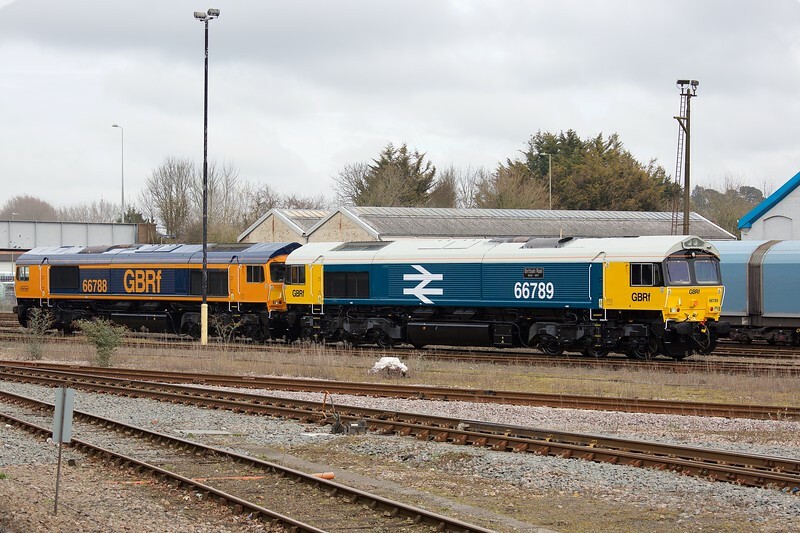 Big news in February 2018 was the unexpected repainting by GBRf of 66789 in 'revised standard' livery, to commemorate the 70th anniversary of the formation of BR in 1948. Released from Eastleigh Works on 5th March, I was lucky enough to find the loco with sister 66788 whilst returning from business that day in Southampton. The pair were former DBC 66250 and 66238 respectively. Magnificent! The 'New Measurement Train' entered service in May 2003, with regular power cars 43013, '014 and '062 upgraded with MTU engines from 2009. 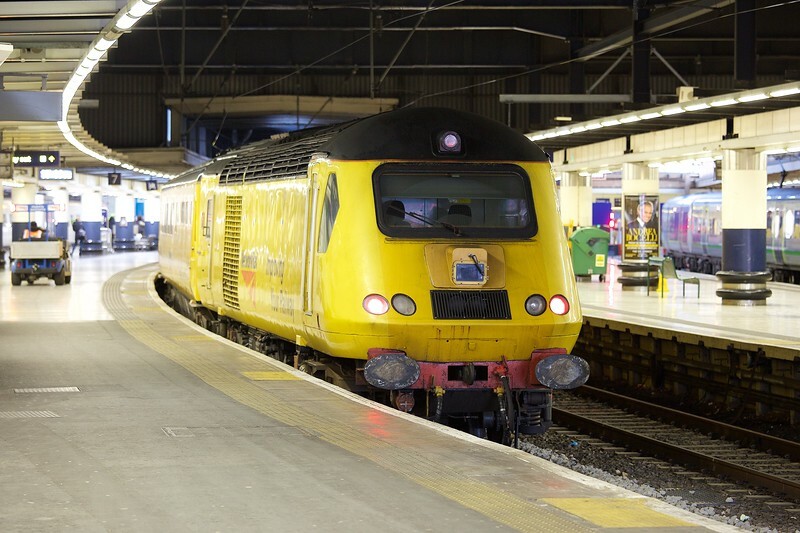 The train operates to a 13-week inspection cycle and, on 20th March 2018, was captured at London Euston. 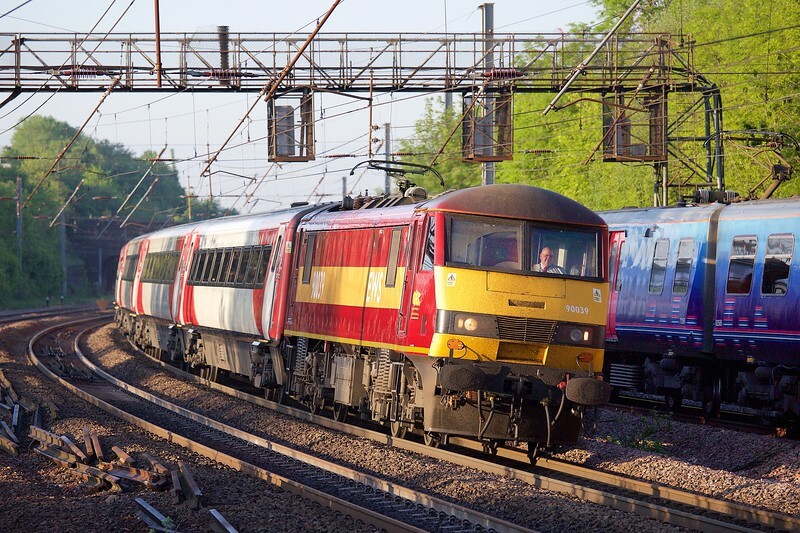 43013 sits on the rear of a 1Q28 1432 round-trip from Derby RTC that takes in the WCML between Euston and Crewe. 43014 had led in from Derby. 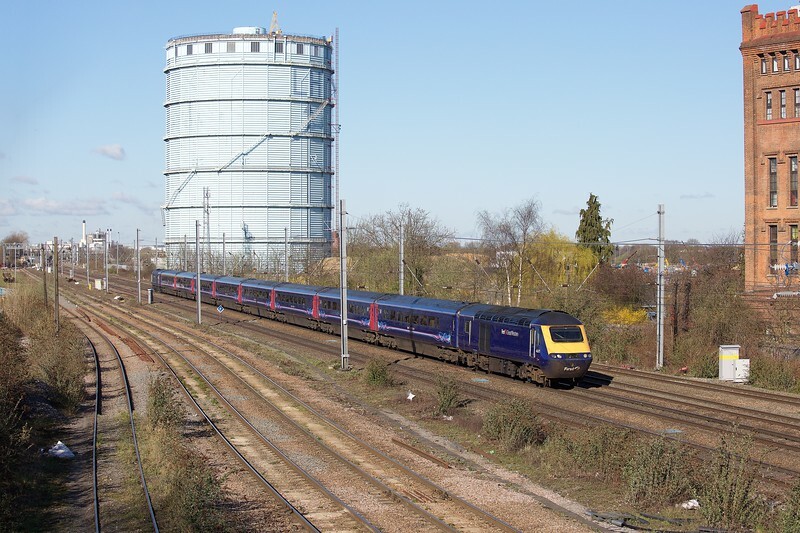 Still a regular sight in April 2018, but not for much longer, 43071 and '020 race towards the capital through Southall with the 1A72 0553 Plymouth - London Paddington. 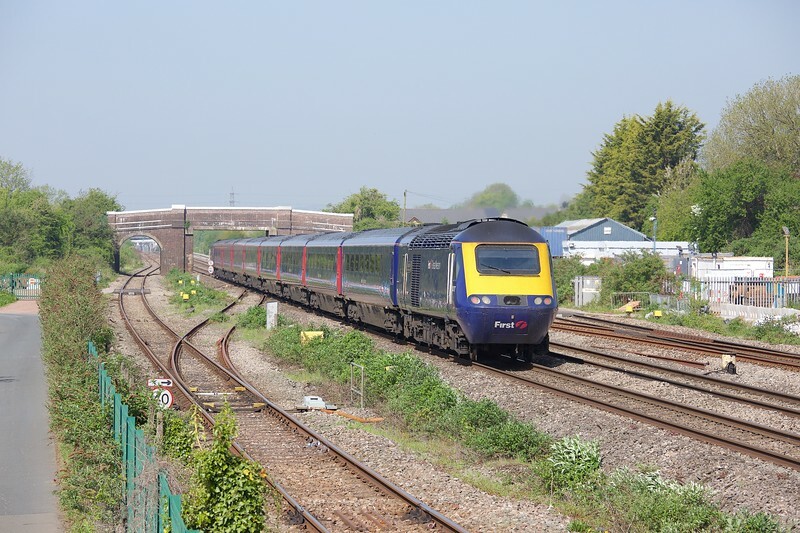 The set wears FGW Blue, but we are firmly in the GWR-era here on 5th April 2018. Spring is the optimal time for photography from my garden, and the best view is of early-afternoon westbound trains on the NLL. 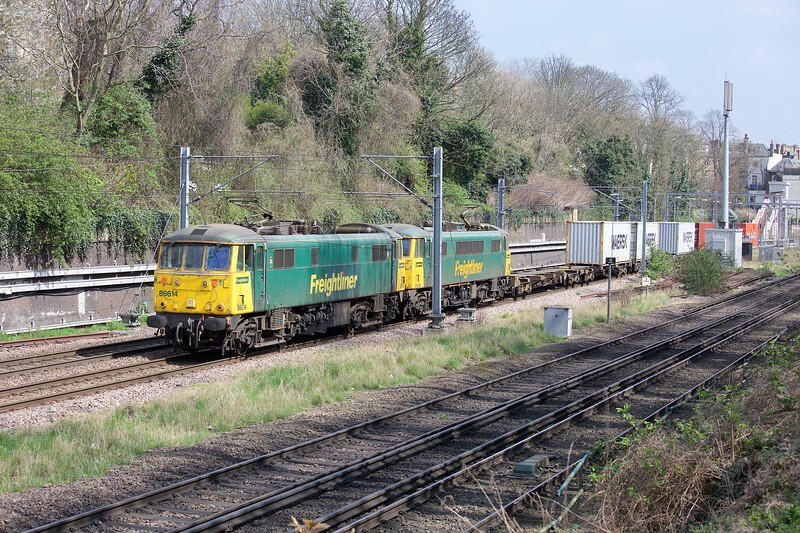 This is the 4M87 0946 Felixstowe North - Crewe Basford Hall passing Canonbury on Saturday April 14th 2018. Veteran 'cans' 86614 and 86628 are in charge. 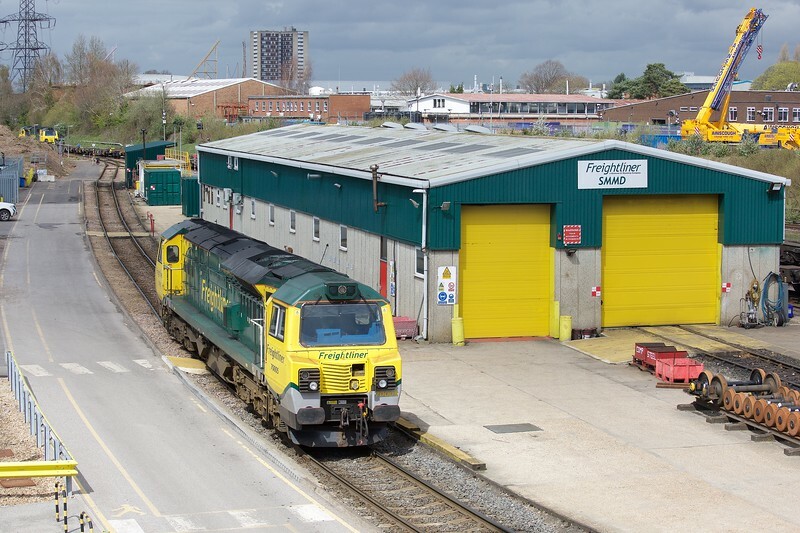 Freightliner's Southampton Maritime Maintenance Depot stands adjacent to the container terminal and can effect servicing and running repairs on locomotives and wagons. Running past the shed on 16th April 2018 is 70005. 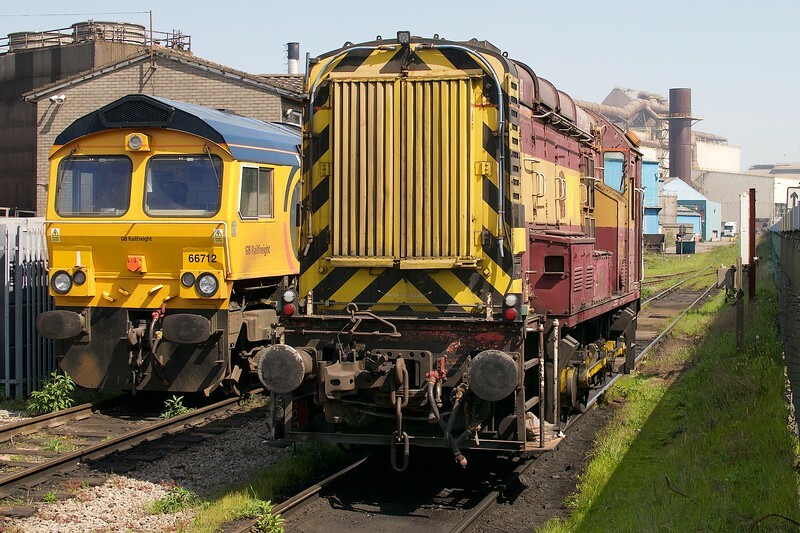 It has shunted the empty wagons it brought in on the 4O14 0558 from Crewe Basford Hall to the sidings for loading. In the background, 70014 is performing a similar move, having arrived on the 4O14 0724 from Birmingham Lawley Street. 60095 was delivered in February 1992 to the Immingham Trainload Construction pool, named 'Crib Goch' (after the mountain in Snowdonia). One of ten refurbished for Colas Rail in 2014-2015, it is seen here in beautiful dawn light at Harrowden Junction on the Midland Mainline on 19th April 2018. 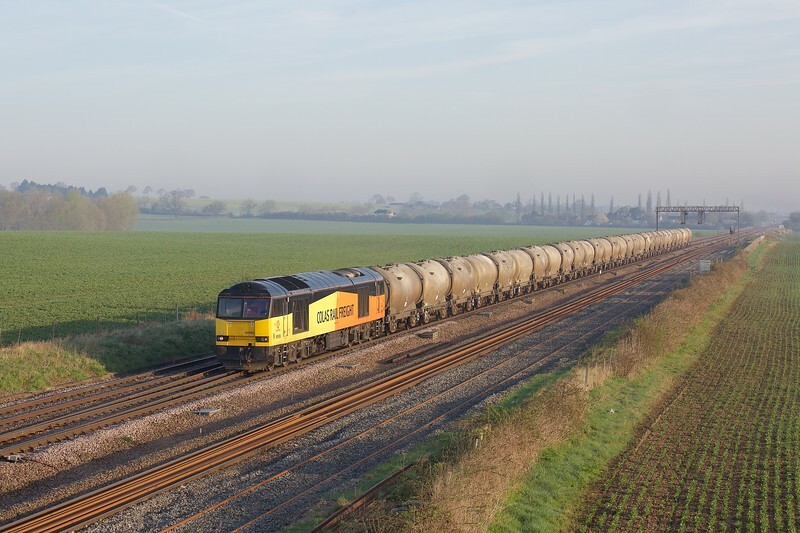 The train is the long-distance 6L44 2222 Oxwellmains - West Thurrock loaded cement, today formed of 4-wheel PCA tankers. What a magnificent sight. 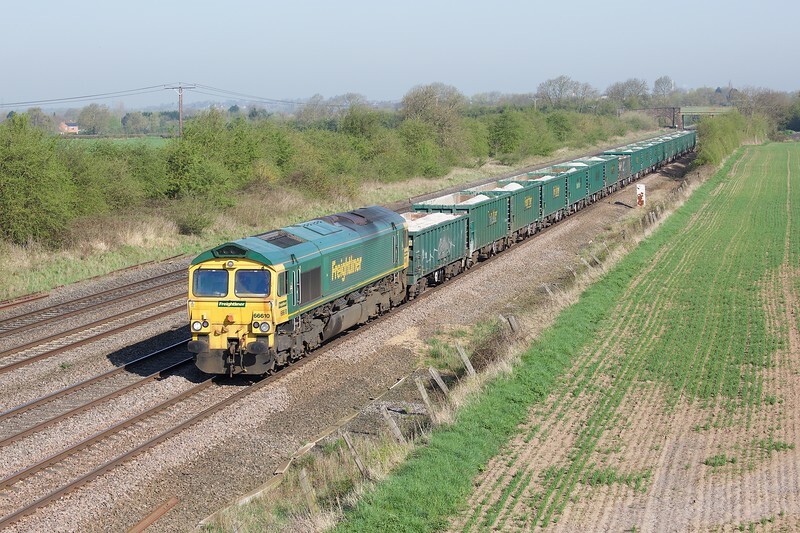 With 1800 tonnes of Peak District stone in tow, 66610 approaches Sileby on 19th April 2018 with he 6L67 0555 Dowlow Briggs ICI Sidings - Peterborough West Yard. I'd arrived at Horbury (Thornhill, Station Road) in time for a pair of Colas class 56s on the 6E32 Preston tanks, only to find they had broken down near Burnley. So I had to be content with this shot of 66504 on a 6A16 1058 Stalybridge - Doncaster (Up Decoy) engineers'. '504 was the first of the class to be repainted in 'Powerhaul' colours. The date is April 19th, 2018. 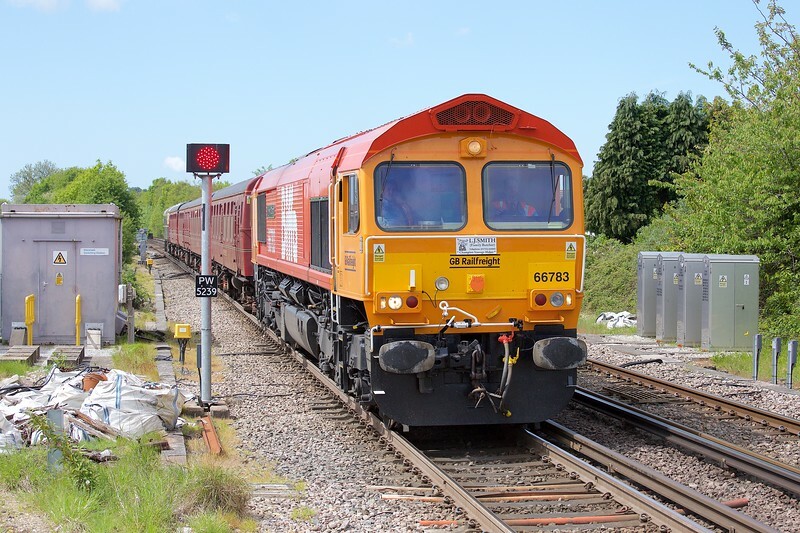 Where once there was coal, now there is biomass - and this is the very epitomey of a modern freight train in 2018: DB Cargo liveried 66128 and high-capacity 'tafoos' biomass hoppers forming the 6H65 1212 Immingham - Drax Power Station. The location is Burton Salmon, and the date April 19th 2018. 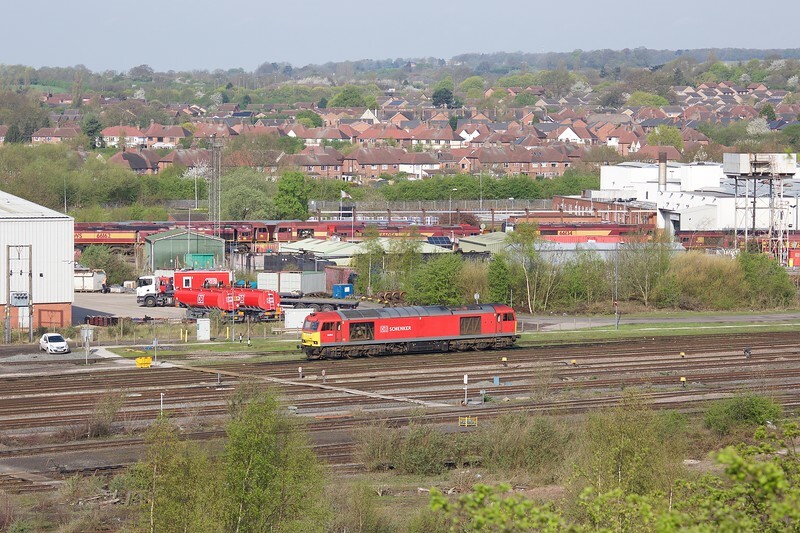 The 6D43 0731 Crewe (Coal Sidings) - Valley empty 'flasks, and 6K41 1458 loaded return were worked by 68002 'Intrepid' and 68026 on Friday 20th April 2018. The pair are seen here at Valley. The flasks are from Wylfa Power Station. 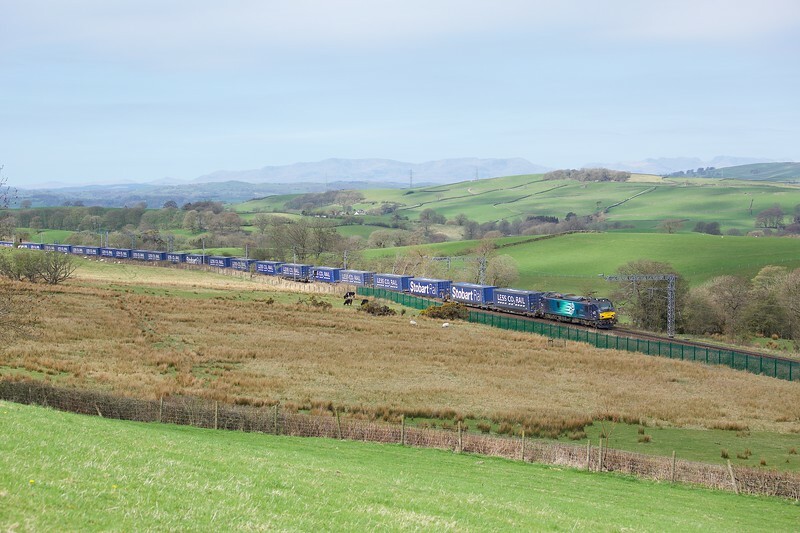 The 4S43 0640 Daventry - Mossend 'Tesco Express' makes an impressive sight as it climbs into the Cumbrian Fells at Lambrigg on 21st April 2018. Leading the train is pioneer class 88, 88001 'Revolution'. 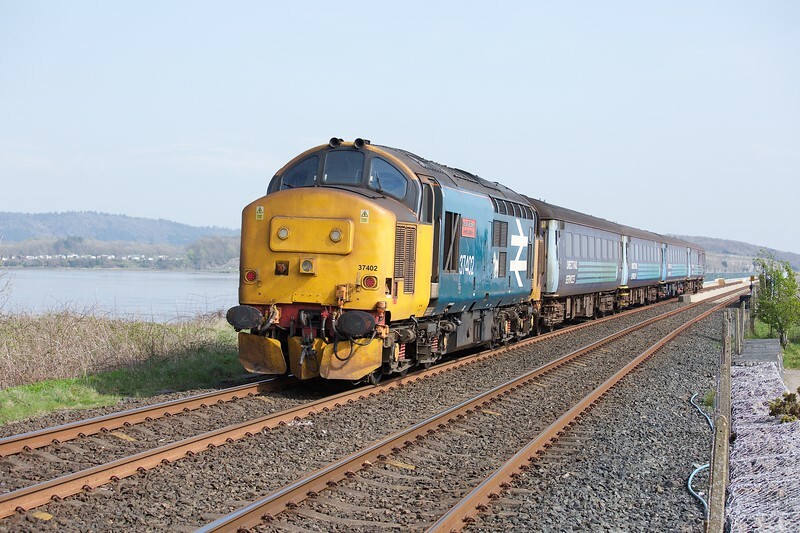 37402 wearing retro 'Revised Standard' colours propels the 2C48 1156 (SO) Carlisle - Lancaster across Plumpton Viaduct, near Ulverston on 21st April 2018. DB-liveried 'Super Sixty' 60063 rests outside its home depot of Toton, Nottingham, on a sunny Sunday 22nd April 2018. 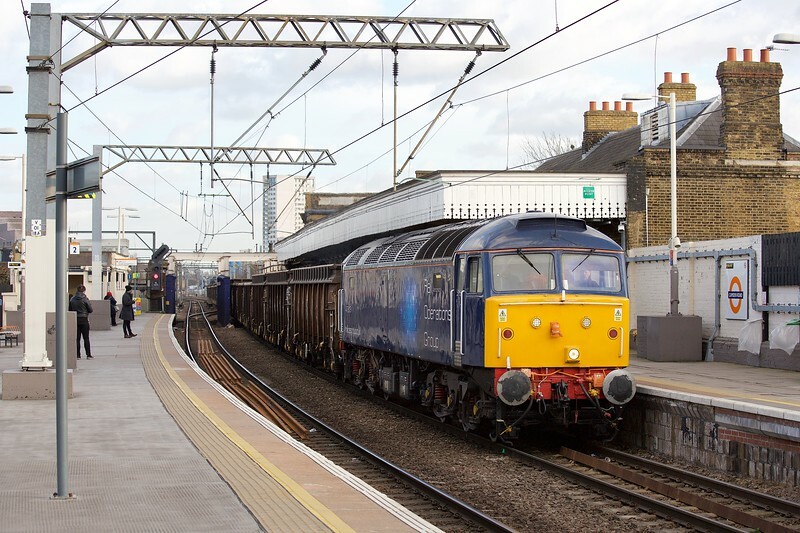 The RVEL 'Ultra 73' programme for Network Rail saw 73104 and 73211 converted into 73951 and 73952 in 2014. They saw little use initially, but were named 'Malcolm Brinded' and 'Janis Kong' after NR Non-Executive Directors. 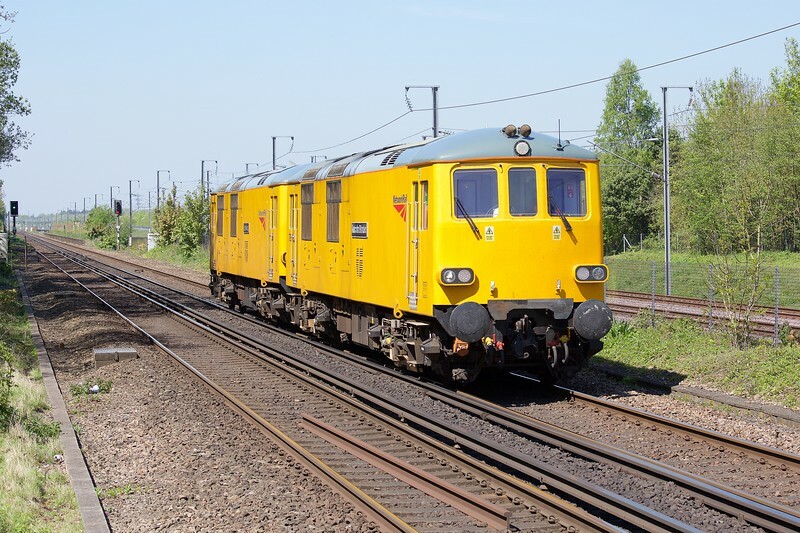 Rare birds, they first arrived in the South East to test their third rail equipment on 15th April 2018, returning from Dollands Moor to Derby RTC on 5th May. Based at Ashford, I was pleased to capture this image of the pair at Westenhanger on 5th May 2018, '951 leading, working 0Z73 1205 Ashford Up Sidings - Dollands Moor ahead of leading a test-train back to Derby. That's HS1 alongside. 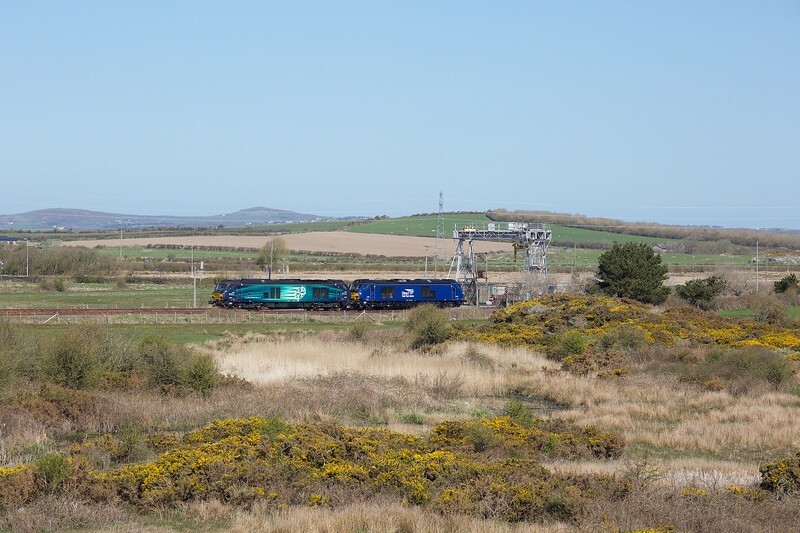 May 2018, and still no sign of GWML electrification at Magor! 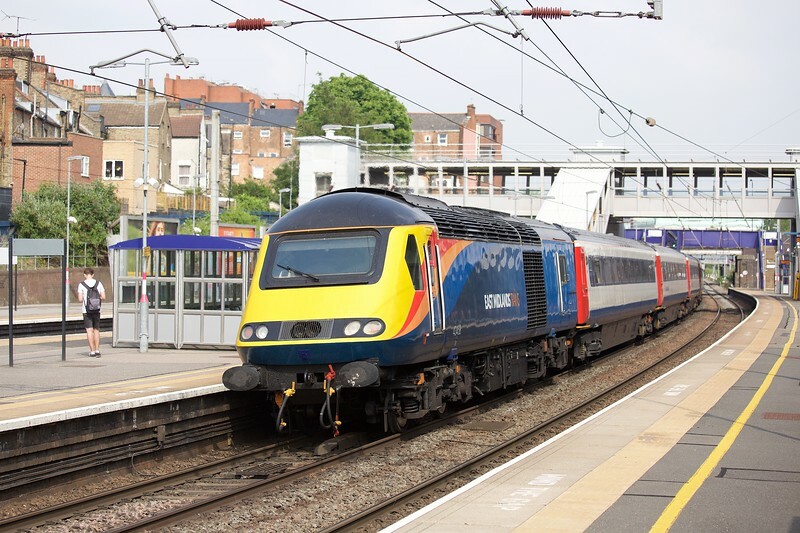 This shot could've been taken several years earlier given that the HST set working the 1B15 0657 London Paddington - Swansea still wears FGW blue. 43071 leads into the distance; 43017 is on the rear. Glimpsed over the perimeter fence on 7th May 2018, Harry Needle's 08389 is seen stabled at Cardiff Celsa steelworks, alongside GBRf 66712. The 'gronk' was built at Derby Works in April 1958 so has just passed its 60th anniversary in traffic. Although withdrawn by EWS in May 2011, it still carries that operator's livery. Note the remote control equipment. Duffryn is just to the west of Newport. Bank Holiday Monday, 7th May 2018, sees 43181 lead '194 on a 1B25 1022 Reading - Swansea (the direct line into Paddington being closed for engineering work). EWS-liveried, DBC-operated, VTEC-hired class 90 90039 is leaning into the curve at Harringay, and just getting up to speed with the 1D02 0630 London Kings Cross - Leeds on 9th May 2018. Exactly one week later came the news that VTEC would become LNER. The Swanage Railway Diesel Gala in May 2018 saw through running to the national network at Wareham. On Sunday 13th May, 66783 'The Flying Dustman' in its peculiar 'Biffa' livery leads a 4TC set and 33012 into Wareham with a 1Z44 1055 departure from Corfe Castle. The loco was formerly EWS/DBC 66058 and as one of the Lickey Banker fleet still carries an additional headlamp. At Gatwick Airport on business on May 15th 2018, I arrived just in time to see 59004 'Paul A Hammond' speeding north with the 6V60 0925 Ardingly - Acton Yard stone empties. 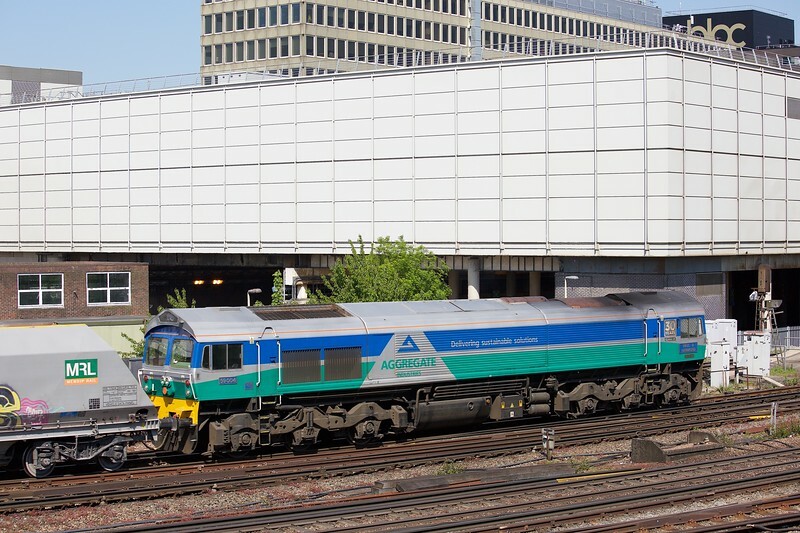 The loco wears the 'Aggregate Industries' livery, and various additions commemorating the 30th anniversary of the class which took place in 2016. 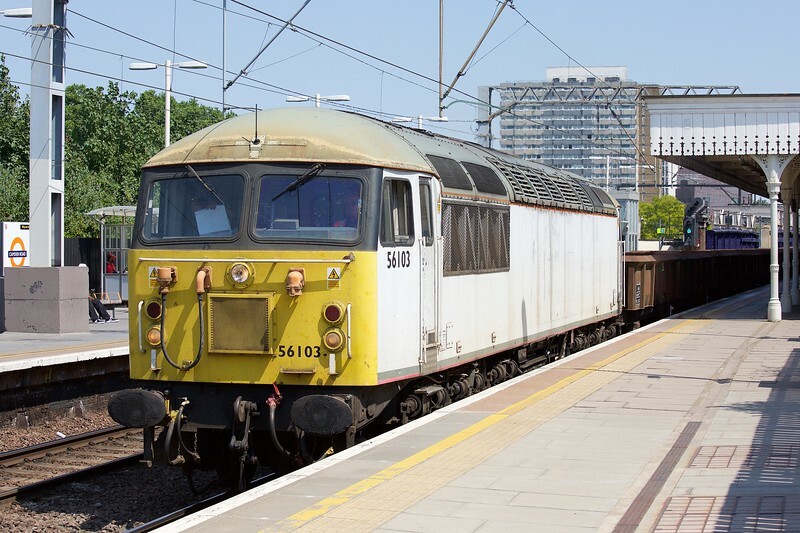 2018 saw the welcome return of DBC electrically-hauled freight to the NLL, in the form of the 6L35 1739 Mossend - Dagenham and 6X77 1354 loaded return car train. 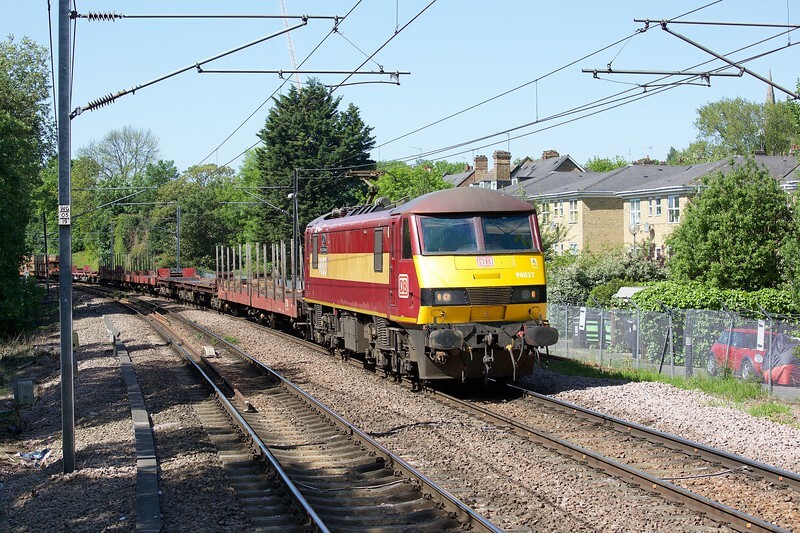 These are the 6L35 empties passing Brondesbury in glorious spring sunshine on 17th May 2018, appropriately led by 90037 ' Spirit of Dagenham'. 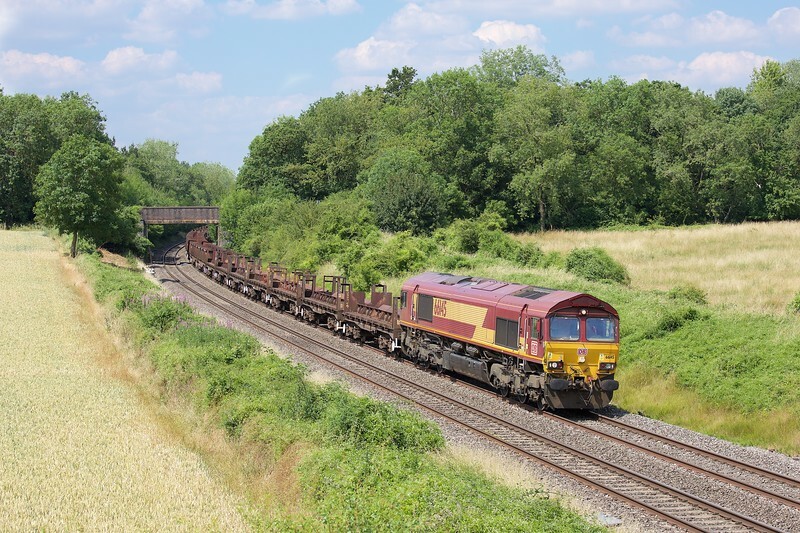 The 0904 Ditton (Foundry Lane) - Dollands Moor passes South Kenton on 26th May 2018 behind 66002. 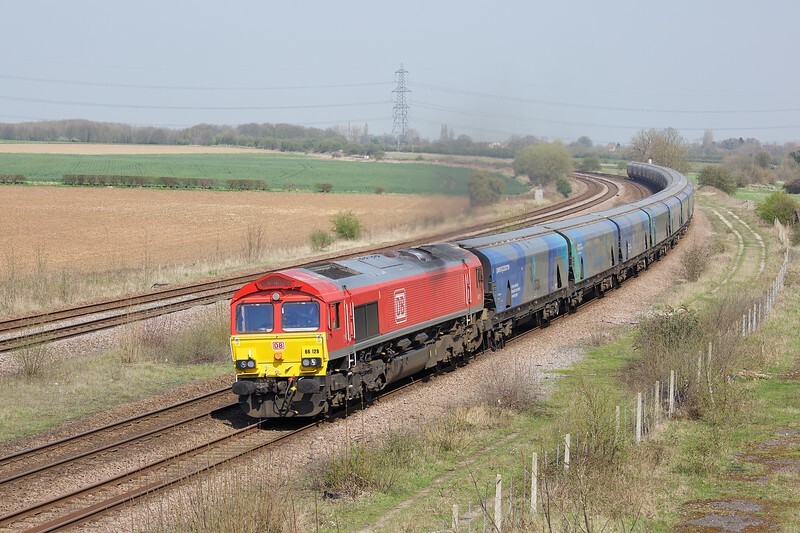 This is an interesting working and I learnt more from the ever excellent source of advice that is the Freightmaster Forum! At the front of the train are 'IWA' vans loaded with aluminium ingots from Novelis Recycling in Warrington, to Neuss in Germany. 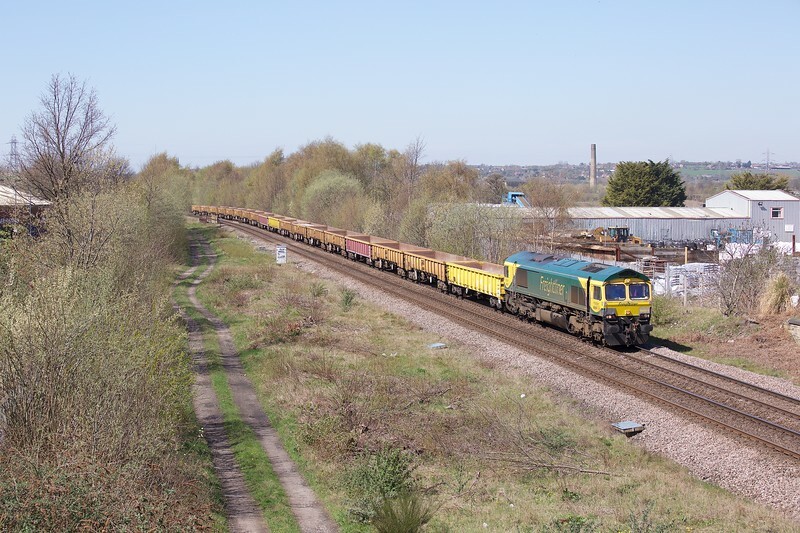 The train is loaded in both directions and returns with aluminium coil for Crown Bevcan in Carlisle (roaded from Ditton). 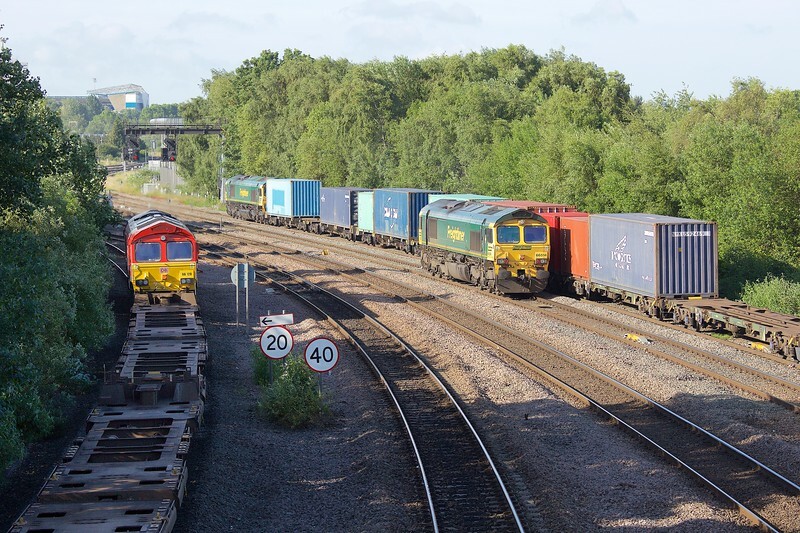 At the rear of the train are 'IKA' intermodal flats, carrying Jaguar / Land Rover branded containers which inbound carry metals unloaded at Daventry. The train only stops at Daventry northbound, so the empty flats return to the continent via Ditton! 66002, and pioneer 66001 (in DB red) are readily identifiable by the absence of a buckeye coupling. 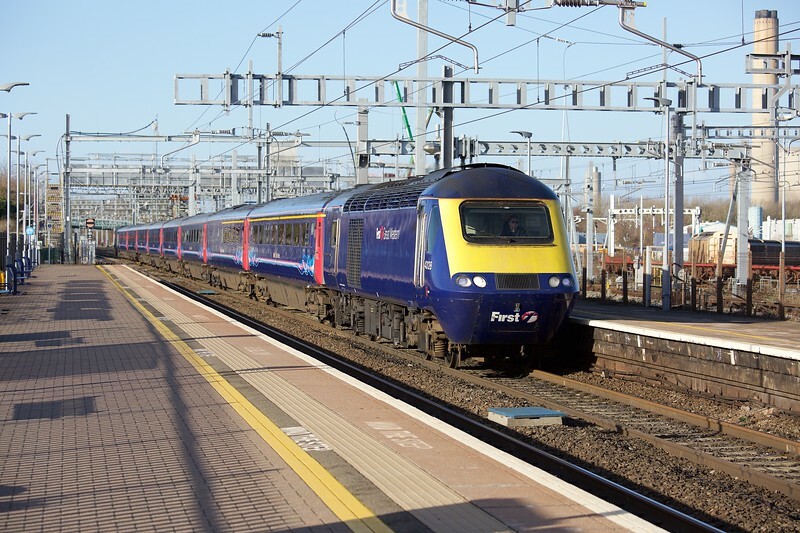 Well into their fifth decade of service, the venerable HST fleet saw changes in 2018 with deployment on ScotRail internal trains, GWR 'Castle' short sets working in the West Country and - seen here - the transfer of the former Grand Central power-cars to East Midlands Trains. The buffer-fitted fleet entered service in a new iteration of the attractive EMT livery. Advance 'gen' on Bank Holiday Monday 28th May 2018 enabled me to bag this shot of 43468 (trailing 43467) passing West Hampstead Thameslink with the 1C52 1359 Sheffield - London St. Pancras. The clouds cleared just in time and I'd nearly been bowled, so I was pleased with the result. 43468 was new as 43068 in November 1977 as part of ECML set 254007. A busy scene at Landor Street Junction, Birmingham on the morning of Thursday June 21st 2018. 66128, left, has the 4O43 0359 Wakefield Europort - Southampton Western Docks DB intermodal in tow. 66555, right, will follow with the 4O15 0721 Freightliner from Lawley Street to Southampton Maritime. 66514, centre, had drawn 4O15 out of Lawley Street and is running past the train to return to the terminal and its next duty. 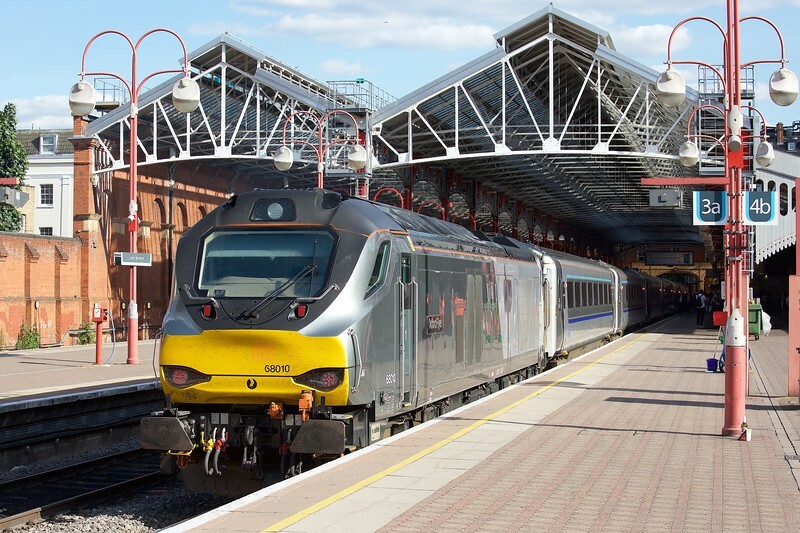 Returning from business in Birmingham on June 21st 2018, I had 68010 'Oxford Flyer' on the 1H62 1555 from Moor Street to London Marylebone. The loco is seen on arrival at Marylebone, prior to working back with the 1K54 1815 to Kidderminster. The truly remarkable sight (and SOUND) of a class 33 working a scheduled passenger train in 2018! 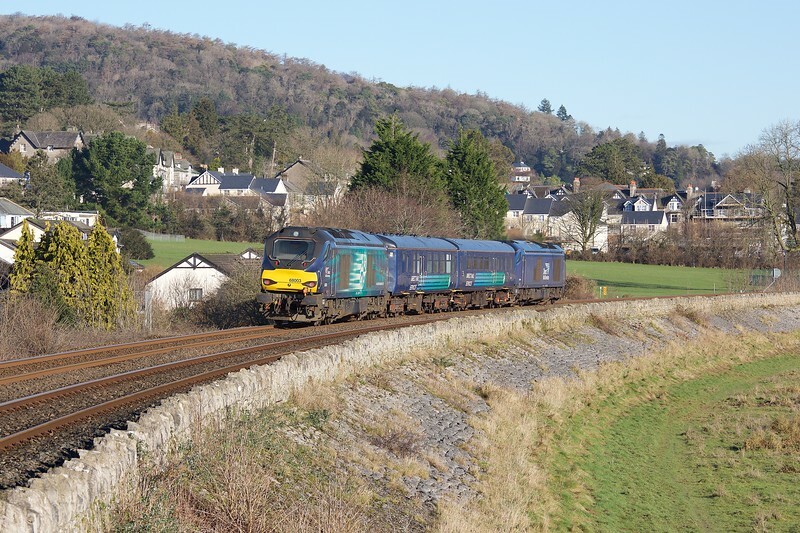 The Northern timetable meltdown, due to late cascade of DMUs from Scotland and delayed North West electrification saw all trains withdrawn from the Windermere branch until West Coast Railways stepped in to provide cover. This is 33029 arriving at Oxenholme on 23rd June 2018 with the 2Z02 1000 from Windermere. 57316 is on the rear. The trains also enjoyed class 37 and 47 traction. Nice while it lasted! 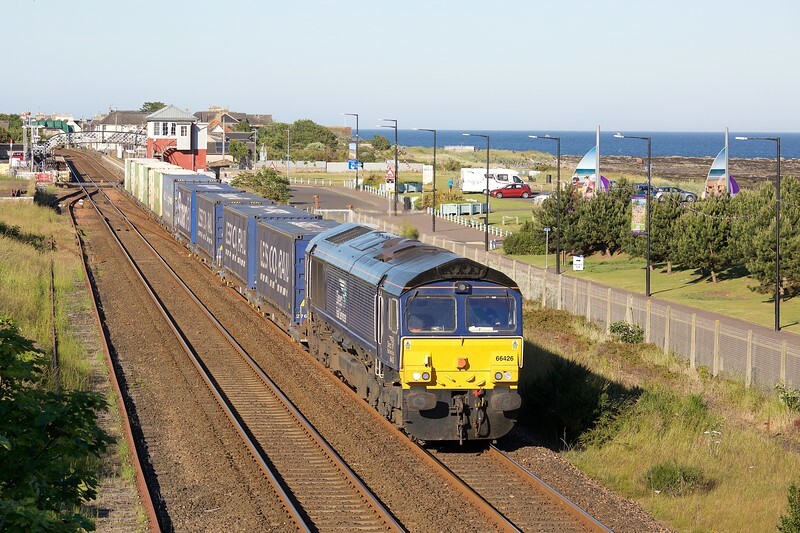 In beautiful evening light, 66426 races through Carnoustie on 24th June 2018 with the 4N83 1809 Aberdeen Craiginches - Grangemouth DRS intermodal conveying Tesco and Asda containers. 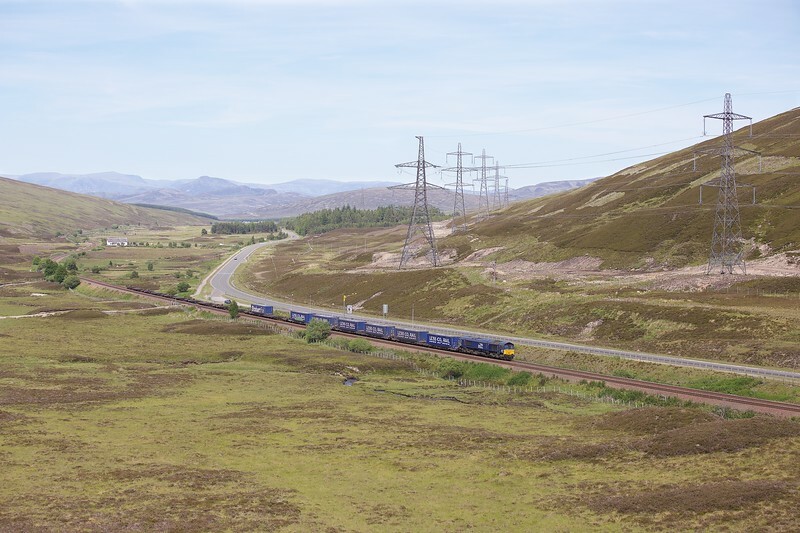 Monday 25th June 2018 saw 73970 in charge of the 1A25 0443 Edinburgh - Aberdeen portion off the 1S25 2100 London Euston - Inverness / Aberdeen / Fort William 'Caledonian Sleeper'. The formation of two Mark 2 seated coaches and two Mark 3 sleeping cars will soon be replaced by new Mark 5 stock, on test at the time. 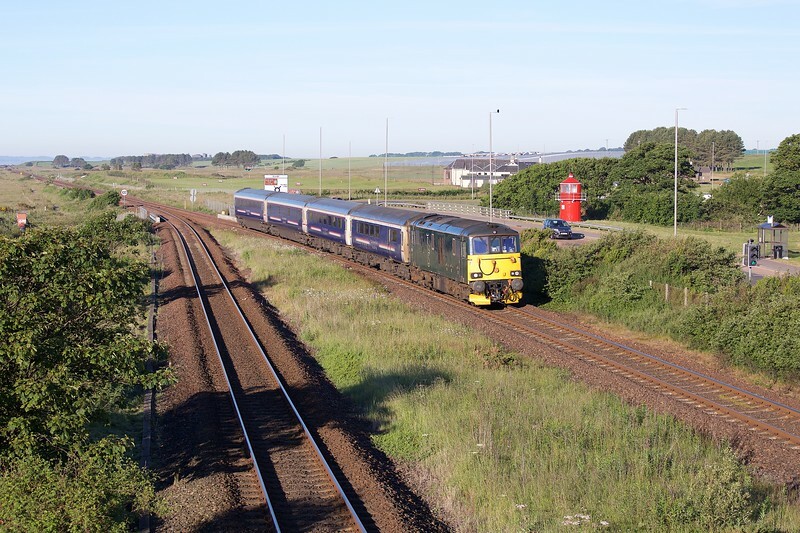 The train is seen just south of Arbroath. 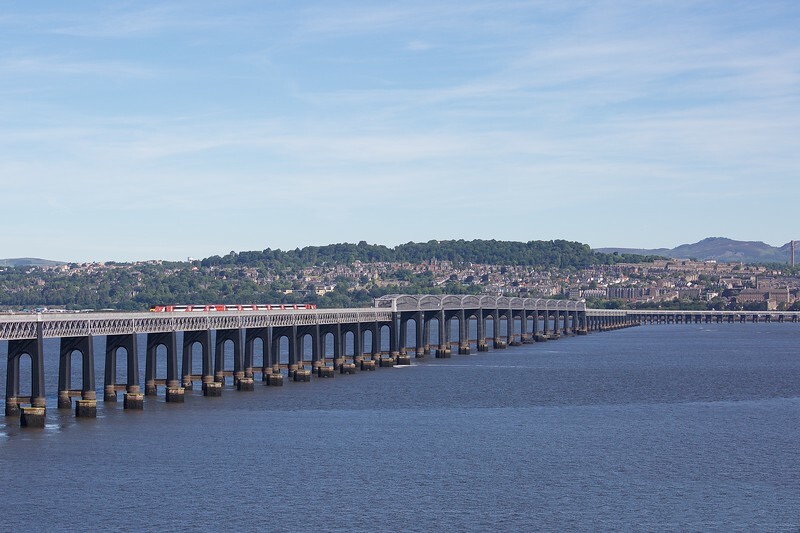 On the first weekday of LNER operation of the East Coast franchise, Monday 25th June 2018, VTEC-liveried 43277 and 43316 head south from Dundee and across the Tay Bridge with the 1E11 0752 from Aberdeen to London Kings Cross. The journey is timed to take 6 hours 59 minutes. 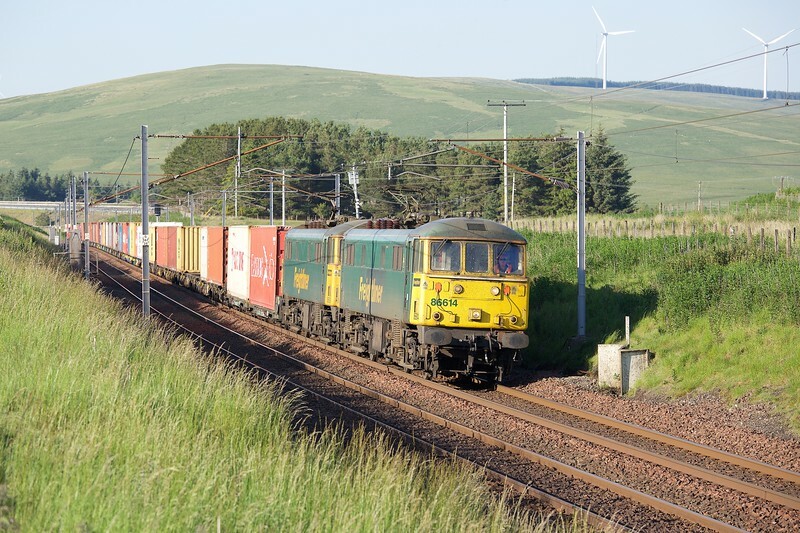 The regular SuX 4D47 1307 Inverness - Mossend DRS intermodal is seen racing south through Drumochter behind 66433 on 25th June 2018. The Highland Mainline around Dalwhinnie is one of my favourite stretches of railway and this was my first visit in good weather. 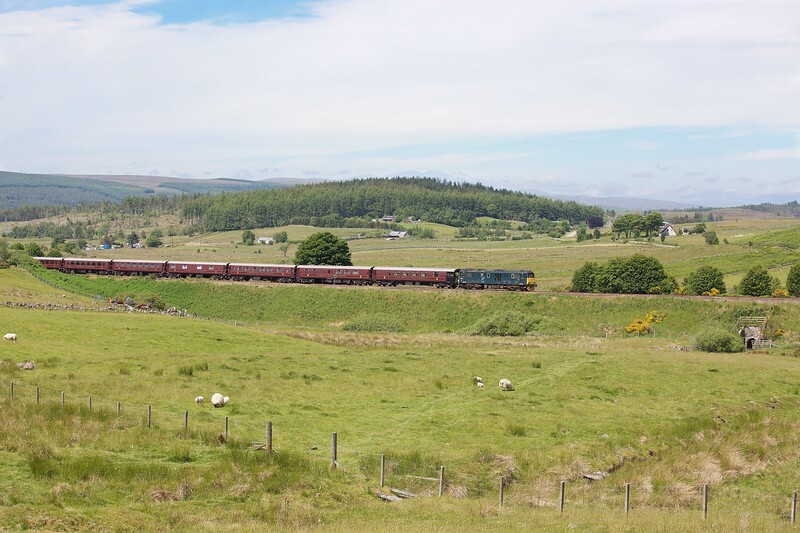 This is Tomich, to the east of Lairg on the Far North line - not a common place to see a locomotive hauled passenger train, but the Royal Scotsman does make occasional visits as here on 26th June 2018 with a 'Scottish Golf Tour'. 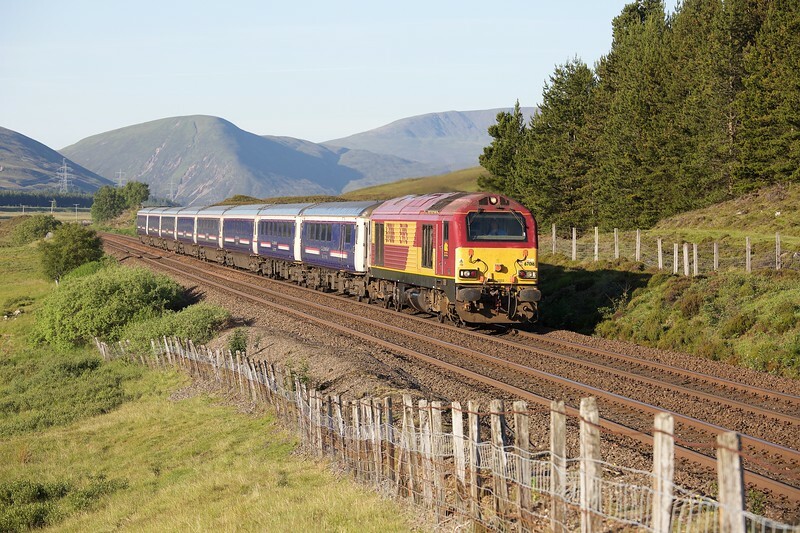 73969 is deputising for 66743, and trailing 66746 on this 1Z37 1133 leg from Brora to Kyle of Lochalsh. 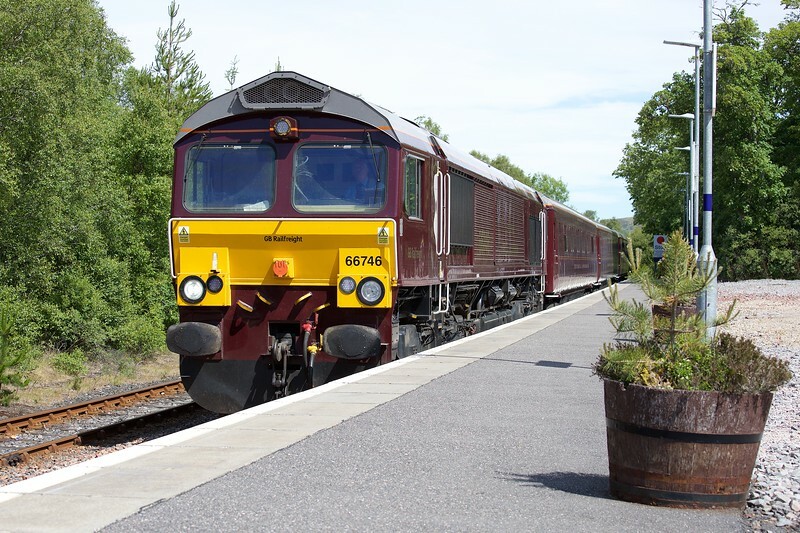 Having photographed the train earlier, just to the east at Tomich, we managed to reach Lairg station in time for a second shot - this time with 66746 in dedicated 'Royal Scotsman' livery leading the 1Z37 1133 Brora - Kyle of Lochalsh. The date is a glorious 26th June 2018. Although taken on 27th June 2018, this image could have been captured ten years earlier since the class 67 wears EWS livery and the eight coach rake of mark II and III coaches all remain in First Group colours. In beautful early morning light, 67016 powers towards Dalwhinnie with the Inverness portion of the previous evening 2100 'Caledonian Sleeper' departure from London Euston to Inverness, Aberdeen and Fort William. Quite something to see the West Highland in fine weather! 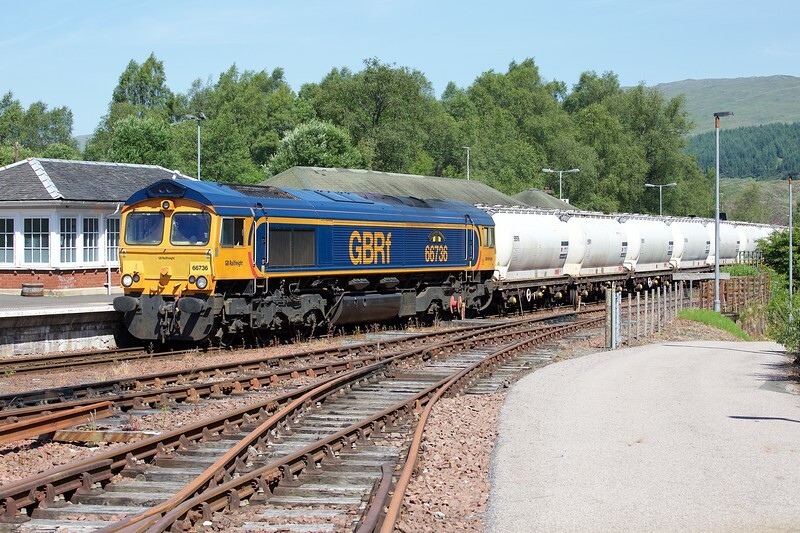 In perfect light, 66736 'Wolverhampton Wanderers' creeps into Crianlarich with the thrice-weekly 6E45 0807 empty alumina tanks returning from Fort William to North Blyth. Evening in the scenic Clyde valley at Elvanfoot on 28th June 2018. 86614 and 86638 are heading south and about to do battle with Beattock whilst heading the 4M11 1814 Coatbridge - Crewe Basford Hall 'liner. I've edited a distracting electrical cable out of this shot. 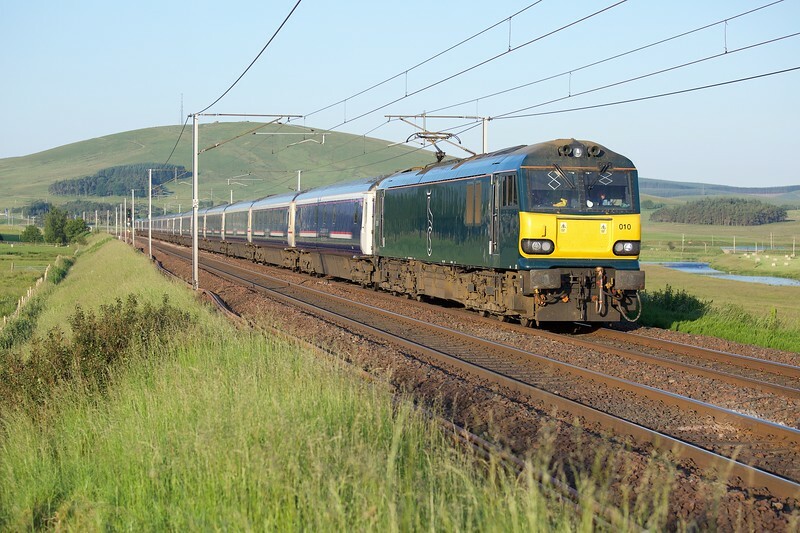 The 16-coach 1S26 2350 'Lowland' Caledonian Sleeper from London to Glasgow and Edinburgh is an impressive train. At dawn on Friday 29th June 2018, the working passes Wandel in the Clyde Valley. 92010 has hauled the train from Euston and will take the Glasgow portion forward from Corstairs. What a magnificent sight! 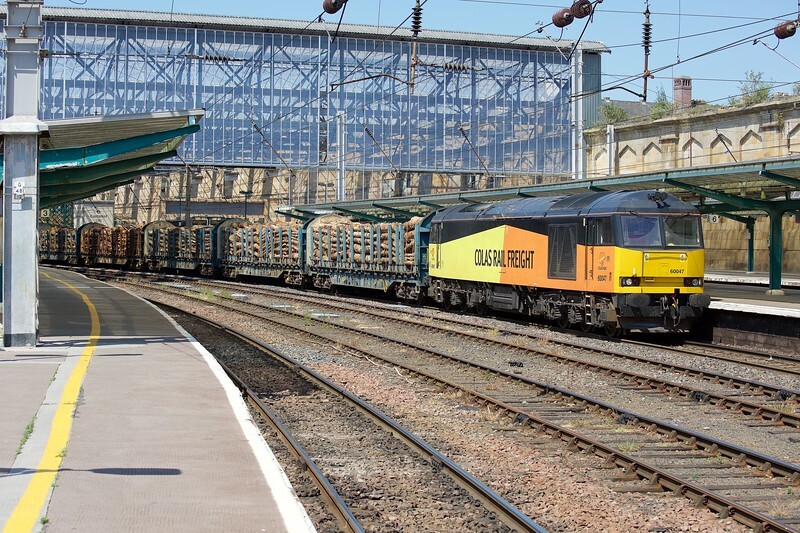 60047 will take the 6J37 1258 Carlisle Yard - Chirk (Kronospan) via the Settle and Carlisle route today, and is seen here easing through Carlisle station on 29th June 2018. 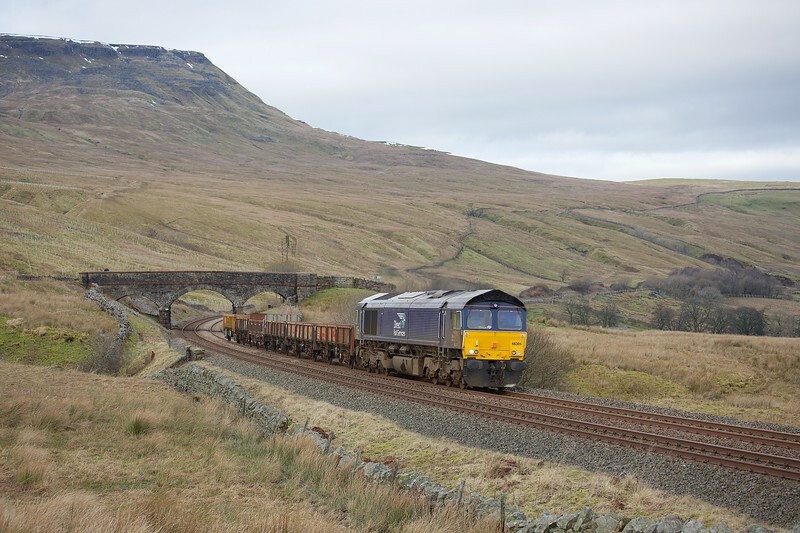 One of ten class 60s refurbished for Colas, the loco was delivered in February 1991, and accepted for traffic in the coal sub-sector that April, working off Stewarts Lane depot and named 'Robert Owen'. 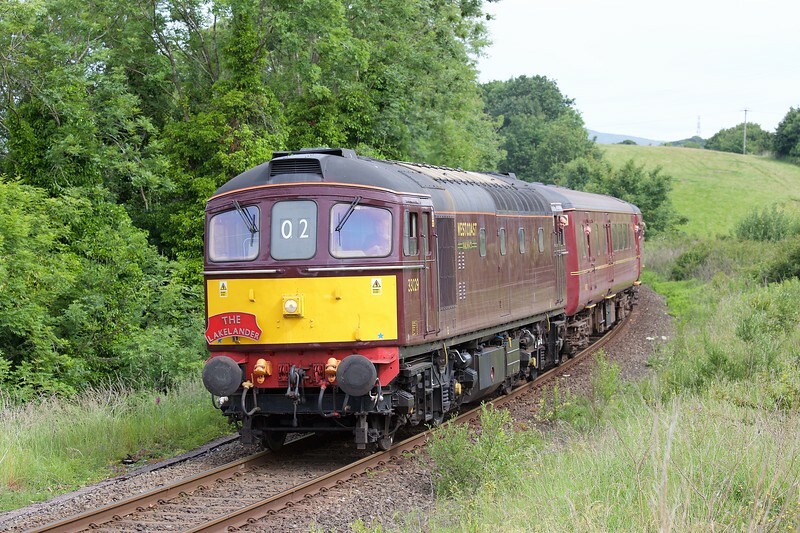 56103 returned to traffic in June 2018, still in 'Fertis' grey, and July found the loco in use on the 'Barrington Spoil'. This view from Camden Road on 3rd July sees the loco heading 6M05 1150 Barrington - Willesden empties. 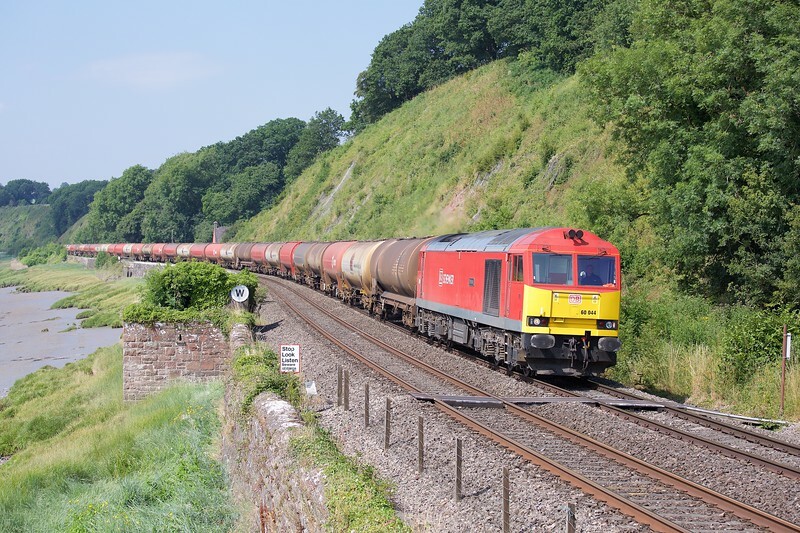 66145 leads 6V92 1022 Corby - Margam empty steel carriers through Besford on 5th July 2018. The loco retains as-built EWS livery, but with the EWS logos replaced by DB. 37401 'Mary Queen of Scots', failed, was stabled in the 'Parcels Siding' at York on the sunny afternoon of Saturday 7th July 2018. The loco looks great in mid-1980s retro 'Revised Standard' livery with Eastfield depot embellishments.